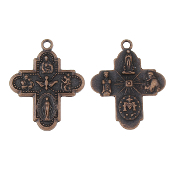 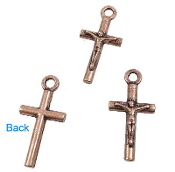 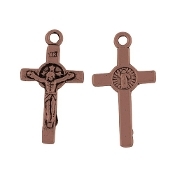 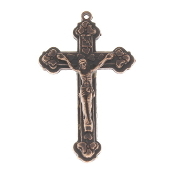 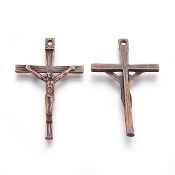 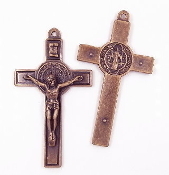 Caravaca Catholic Crucifix Cross Antique Copper Finish 1 1/16" Catholic Crucifix Copper Finish Cross 1 5/16 x 3/4"
Caravaca Cross Copper Finish, a cross coated with an old-fashioned heirloom finish. 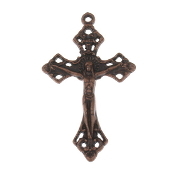 Its antiqued finish will provide the elegant and classic look of a family heirloom. 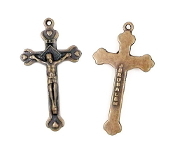 Crucifix with Grapes and Wheat Design Inexpensive Small Metal Crucifix Rosary parts-Crucifix Necklace-Rosary Crucifixes Pendant--Crucifix to make rosaries. 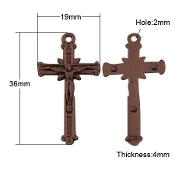 Measurement does not include eyelet-Plain Back (No wording). 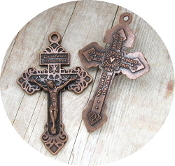 Copper Finish Crucifix with HEARTS 1 7/8 x 1 1/8" Copper Finish Traditional style Crucifix 1 1/16" x 7/8"
Fancy Catholic Crucifix Copper Finish 1 3/4" x 1 1/4" Filigree Cross Copper Finish Crucifix 1 3/4" x 1 1/8"
Measurement does not include eyelet. 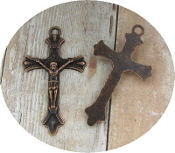 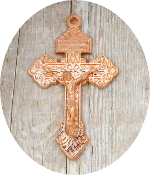 Copper finish cross, a crucifix coated with an old-fashioned heirloom finish. 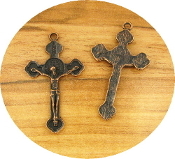 Its finish will provide the elegant and classic look of a family heirloom. 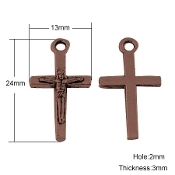 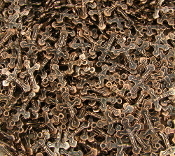 Eyelet holes on both the top AND bottom of the cross-Copper Finish Connector Crucifix - Measurement does include eyelet. 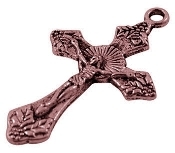 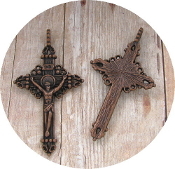 Ornate Vatican Style Crucifix 1 3/4 x 1 1/4" Copper Finish Papal Crucifix cross Copper Finish 1 3/4" x 1"
Small Copper Finish Crucifix Cross 2.4 x 1.6cm Rosary Parts St Benedict Crucifix Jubilee Cross Copper Finish 2 3/4x 1 11/16"